So, I decided to participate in Mikubook.com's Mikutery World competition event. Basically, this is an puzzle event made up of three sections. Each sections has a few puzzles for you to solve. Basically, the rules are quite simple and the event itself contains only a few puzzles. However, each puzzle takes quite a long time to figure out. As such, I spent a couple of hours just finishing Q1 Part 1 (each section is a 'Q'). The puzzles are of huge variety, the first one was a 'simple' sliding puzzle game where you are tasked to complete a picture of Miku. Question 1 Part 2 was a simple word puzzle that led you to Twitter. Question 1 Part 4 took a while for me to figure out. With some help from the hint mail as well as Google, I managed to find the three mistakes in the word puzzle. Lastly, Question 1 Part 5, was a color-in puzzle where you had to color in a diagram. Then you had to find a specific color on the front page of Mikubook and then watch a video. After that you will find the answer you are looking for. So this basically sums up Question 1 in a nutshell. As for Question 2 and 3, I couldn't be bothered completing them as I was quite frustrated at the really ambiguous hints that were given. In the end, I decided to be a good boy and do my uni work. 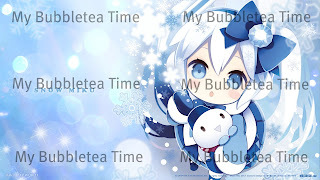 Oh, and anyone that completed Question 1 received a free 'Snow Miku' wallpaper which I will display here. Now I must tell you, I worked pretty hard to get this wallpaper. I love it very much and it is currently my desktop wallpaper. I am telling you NOT to steal this wallpaper off my blog as this wallpaper is currently in the Mikubook competition. If you want it, go get it yourself by joining in the competition here. Don't be a cheat and downloading this wallpaper without working hard for it. Trust me, earning this wallpaper gave me satisfaction. I've warned you. Google recently launched its new 'Google Play' service which replaces the Android Market whilst combining Google Music, Google Books and Google Movies into one application. That was yesterday's news, and now Google is offering a 25c app of the day for a week. Yesterday's app of the day was Where's My Water and today features Flick Golf Extreme. Flick Golf Extreme takes off where Flick Golf stopped. In extreme mode that is. It now features extreme courses from around the world such as grand canyons, icebergs and fighter jets. Sounds extreme? It is. I have played the original Flick Golf and I must admit, I wasn't that impressed by the overall presentation. However, Full Fat has done a great job in listening to their customers and improving the game the way we like it to be. Hurry and buy it now for 25c today only! Visit the Google Play Store.